Located between the bones of your spine are thin, circular pieces of tissue called spinal discs. These disks are designed to cushion the joints of your spine and provide flexibility. A herniated disc occurs when the outer ring of a disc tears or becomes weakened and allows the disc’s inner portion to bulge outward. Most herniated discs occur due to some type of trauma, such as spine injuries or sudden movements. For many individuals, age is a factor that contributes to the likelihood of suffering a herniated disc. As you age, the discs that cushion your spine can become compressed or more brittle, making them more likely to bulge outward or tear. 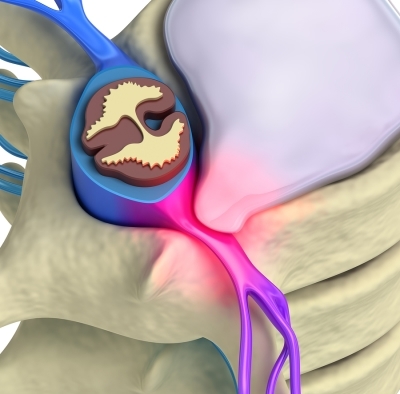 When a person suffers a herniated disc, this issue does not always present symptoms. However, most people will experience discomfort or other symptoms when they suffer from this problem. Common herniated disc symptoms include back pain, pain that travels down through the foot, muscle weakness, tingling, numbness, muscle spasms, and severe muscle pain. How can I reduce my risk of suffering from a herniated disc? Luckily, there are many things that you can do to decrease your likelihood of herniating a disc. First, quit smoking if this is a habit of yours because the nicotine in cigarettes can make your spinal discs more brittle. Also, stay at a healthy weight to prevent putting undue stress on your spine. Exercising regularly and practicing good posture are also important when it comes to preventing herniated discs and, lastly, always remember to use proper lifting techniques.